Every time Ottawa Jr. Senators volunteer Rose Courchaine sings “Jackson” by Johnny Cash before a game, the team’s star rookie scores. Or so she says. So on Mar. 9, as the Jr. Senators were getting ready to take on the Kanata Lasers, Courchaine sang the iconic tune to herself before taking her place at the gate, where she ushered players onto the ice with a smile and a fist bump. Kyle Jackson was the last one to pass. At 16, Jackson is younger than everyone else on the ice by more than a year. There’s a good chance he’s also better. The North Bay Battalion prospect and 2021 NHL Draft hopeful is spending the season with the Ottawa Jr. Senators in the Central Canada Hockey League, and what a season it’ has become. League officials agree. “Jacko” has already won the CCHL’s rookie of the year award. He leads the league in rookie scoring and is 16th overall, despite most of his peers are two to four years older. He now plays on what would be considered the Jr. Sens’ top line, with two 20-year-olds who are top-10 in league scoring. Despite his skills and bright future, Jackson still does his rookie duties for the team. After the buzzer sounds to end the warm-up, he stoops over to load the team’s pucks into a milk crate. There’s no glamour in being a young star in this league. The CCHL is Junior ‘A’, one level under Major Junior leagues like the Ontario Hockey League, where the Ottawa 67’s play. While many OHL players are drafted by NHL teams, CCHL players hope to win scholarships to American colleges; others simply have nowhere else to play. On occasion, young players who aren’t quite ready to play in the OHL are loaned to CCHL teams to develop until they’re ready, which is what the North Bay Battalion have done by sending Jackson to the Jr. Sens this season. North Bay draws around 2,300 fans to their games, only around 160 line the bleachers for the Jr. Sens’ game against Kanata. At OHL intermissions, contest winners compete in on-ice challenges. Intermissions at Jim Durrell Recreation Centre are less polished; it takes all of 15 minutes for the Zamboni driver to pilot the vehicle around the ice. Early in the second period, the Ottawa Jr. 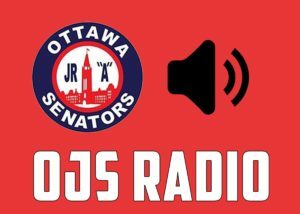 Senators are locked in a goalless tie with the Kanata Lasers and Jackson’s line is hunting the puck in the offensive zone. Jr. Sens captain Darcy Walsh threads a pass under a Kanata defender’s stick and Jackson receives it in the slot, all alone with Lasers’ goalie Gabriel Carriere. Jackson moves to his left, faking forehand, and quickly pulls the puck the other direction to his backhand. The goalie bites. With a flick of his wrist, Jackson sends a shot sailing over Carriere’s outstretched glove for the game’s first goal. People in the crowd jump to their feet. Despite the glowing reviews and current success on the ice, this season hasn’t been easy for Jackson. He struggled at the start and faced heavy scrutiny from his coach. Jackson is a quiet presence on the bench, but he’s answered the coach’s challenge with his play, and others have noticed too. Jackson is expected to play full time in the OHL with the Battalion next season and will be eligible for the 2021 NHL Draft. Dagenais believes he has a good shot. There are several reasons Jackson has improved so quickly, one of them being his size. His eliteprospects page updated last year has him listed at 5-foot 11, 143 pounds. He laughs at that; he’s obviously grown since then. His coach says he’s around 6’2” right now, and he has to crane his neck to make eye contact when talking to Jackson. Jackson says he feels confidence is a big factor too. Pouliot had 42 points in 45 games played with the Hawkesbury Hawks in 2003-04, Jackson put up 54 points in 51 games this season. Rose Courchaine will probably keep singing some Johnny Cash though, just in case. © 2019 Ottawa Junior Senators. All Rights Reserved.